To perform the Cube in Box Mystery Trick, the Magician hands the spectator a cube and a small box into which the cube fits snugly. On each of the six cube sides is a different design. The spectator then selects one design, and places the cube into the box, while the magician's back is turned. Handing the box over to the magician is all it takes – the magician instantly knows which of the six designs was selected. 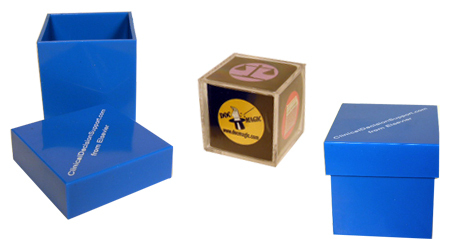 The Magician accomplishes this feat by changing the position of the box top and secretly viewing the top of the cube before pretending to open the box and showing it to the customer (full instructions are included).